Looking over the guest lists for all of the Sunday shows, viewers will see two Republican senators (McCain, Graham), three Republican House members (Boehner, Ryan, Schilling), three likely Republican presidential candidates (Barbour, Gingrich, Pawlenty) … and zero Democrats from Congress or the Obama administration. It’s a little worse than usual as generally there is at least one token Democrat. In general, if it’s Sunday, its meet the Republicans. Fringe returned to the alternative universe in this week’s episode. Other than for the characters being the cooler versions from the other universe, most of the episode seemed like it would have worked as a stand-alone story in either universe. (Major spoiler ahead). In the end we found the reason why this story had to take place over there–Fauxlivia found out that she is pregnant and Peter is the father. 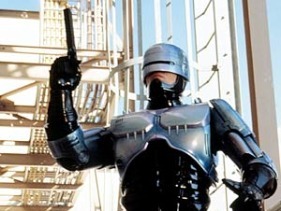 Detroit Mayor Dave Bing has turned down the idea of a statue of Robocop to be built in Detroit. Science fiction fans didn’t go along with the idea to ignore the hero of the 1987 movie which took place in Detroit. There is a movement to obtain private contributions to build the statue. There are already several examples of statures honoring fictitious characters in other cities including a statue of Rocky in Philadelphia, Superman in Philadelphia, and Yoda in San Francisco. Berman: I made it very clear to Gene that I had not watched The Original Series. I had seen one of the movies. I’d probably seen a few episodes of The Original Series at some point, in my pre-college or college period. But it was nothing I was serious about watching at the time. A day or two later I got a call from Gene’s confidante and attorney, Leonard Maizlish, who said that Gene wanted to go to the studio and ask for me to be released from my vice-president-ship so that I could come work with him on this new series. I think his reasons were two-fold. First of all, I was young compared to the other people who were involved with the project at the time, because Gene was dealing with Bob Justman and Eddie Milkis and Dorothy Fontana, people who’d worked with him on the original series. I was a good 20 years younger than this group. More importantly, Gene was very specific about the fact that my not knowing much about Star Trek was something he was very attracted to. He wanted somebody involved in the production of the show who did not grow up with Star Trek and wasn’t enamored by it over the previous two decades like most of the people who were involved with show. We’re talking about before the (TNG pilot) script was written. So that was how I began. I think I was co-executive producer along with Bob Justman, and I was asked by Gene to be involved with the creative elements of the show, where Bob was more involved with the production and budgetary ends of the show. Let’s dig into some complicated ground. Roddenberry got sick, became less involved and eventually passed away. What were your thoughts, as the torch was handed on, about following his vision versus doing what needed to be done to make the show work versus any urge you might’ve had to put your own imprint on TNG? Berman: It was never a sense to me of a torch being passed. That all sounds great in retrospect, but things are never quite as clear-cut as that. As the first few years of TNG went on, Bob Justman left the show and Maurice Hurley and I were involved. And then Maurice left and a fellow named Michael Wagner was hired. He lasted a very short time, and then Michael Piller came on. Gene was comfortable with me taking care of the day-to-day supervision of this program that he’d been involved with for about two years at that point, and he stepped back. He’d come to the office every day. He did a lot of correspondence with people. He and I would talk a lot. He’d read some scripts. But his involvement got smaller and smaller as the months went on. Then he got ill and his involvement got quite a bit less. By the time he passed away, I was, I guess you could say, running TNG along with Michael Piller. And I’d been asked by Brandon Tartikoff, at the time, to develop a new show. This was something that I discussed with Gene, who felt very positive about it. But he was quite ill at the time and wasn’t really interested in getting involved with what it was or what it was going to be about. I would like to think that he had faith in both myself and Michael, who I asked to work with me on what became Deep Space Nine. So, by the time Gene died, there was no sense of “Oh my God, this great responsibility has been put on my shoulders.” I was doing the job I’d been doing for a couple of years and Gene had become, in a sense, a producer emeritus of the organization. I had absolutely no thoughts about putting my own imprint on Star Trek. My interest was to continue to try to do the best work that I could and to hire the best people that I could and to continue on with what Gene set out to do with TNG. It was my hope that the direction we went in with DS9 – and onward with the other shows — was something he would have thought was the right direction to go. I don’t see myself, nor have I ever seen myself, as a visionary who wanted to put his ideas onto the show. I wanted to be as truthful as I could to Gene’s vision, and that was something I was more than comfortable with. During the second part of the interview Berman discussed the three spin-offs after STTNG, Deep Space Nine, Voyager, and Enterprise. This is from the discussion of Deep Space Nine, which I felt was the only spin-off which compared in quality with the original show and Star Trek: The Next Generation. Going into DS9 — with a space station, stories about war, politics and religion, a fractious crew and a commander of color — how ready were you for the backlash from the portion of the fan base that felt the show wasn’t their father’s Star Trek? Berman: At that point, our biggest concern was to do something different. We had a show that was on the air. We had no idea how long it was going to be on the air, but we knew that it was going to continue to be on the air for at least another few years. We didn’t want to send another crew out on a spaceship at the same time the TNG crew was out on the Enterprise. Michael (Piller) and I spent a long time thinking about this. One of the things that Brandon Tartikoff, who was the head of the studio at the time, suggested was The Rifleman, which was a show that he loved when he was a kid. It’s a father and a son out doing good deeds on the prairie. This was an era when television executives loved to say, “Let’s do The Partridge Family meets Father Knows Best.” Roddenberry evidently had talked about “Wagon Train in space” 20 years before and DS9 was “The Rifleman in space.” I think what Michael and I ended up pulling from that was the idea of a father and a son, and we chose to do the story of a man who had recently lost his wife, who was very bitter, and was sent to a very distant space station that was not a Federation facility. As a result, we could have a lot of non-Starfleet people. One of the big problems that Michael and the writing staff (on TNG) had was Gene that believed that in the 24th century there wouldn’t be any conflict between the major characters. Mankind had reached a point where the kind of human conflict that exists today had subsided, and the writers all believed very strongly, in fact, that drama is based on conflict, and they were very frustrated by that. And they were frustrated very often by notes they got from Gene about how he didn’t want conflict between anyone in Starfleet, primarily the main cast of the show. So, what Michael and I felt was that if we placed the show on a Bajoran space station we would have characters like Odo and Quark and Kira, who were regular characters, who were not only not human, but they were also not Federation, and thus conflict could exist among the series regulars. The religious elements you mentioned were not really part of our initial thoughts. That was stuff that evolved. But the idea of a wormhole that led to another part of the galaxy gave us new fodder. As far as hiring a black actor to play Sisko, this was something that meant a great deal to Michael Piller. My feeling was it would be great if we could find the right actor, but that if we couldn’t find the right actor, I felt that it wasn’t necessary to go with a black actor. But we very much wanted to find a black actor who could pull it off because it was time for that. When we met Avery (Brooks), when he came in and read for the role, we felt it was a slam dunk. Berman also admitted it was a mistake to end Enterprise with characters from Star Trek: The Next Generation. (Personally I was not bothered by this, considering how weak the entire series was compared to STTNG, but if there really were fans of Enterprise I could see their objections). Not to beat up on Enterprise, but we’ve got to ask about the finale. “These Are the Voyages…” was clearly the most controversial Trek finale. Some fans groused it was only an hour long, but the more strenuous gripe was that it folded four years of Enterprise into a TNG episode. Were you surprised by the hostile reaction? Berman: Totally. I would have never done it if I had known how people were going to react. We were informed with not a whole lot of time that this was our last season. We knew that this was going to be the last episode of Star Trek for perhaps quite some time – and here we are, almost six years later. So it was the last episode for quite a length of time. It was a very difficult choice, how to end it. The studio wanted it to be a one-hour episode. We wanted it to be special. We wanted it to be something that would be memorable. This idea, which Brannon and I came up with – and I take full responsibility – pissed a lot of people off, and we certainly didn’t mean it to. Our thought was to take this crew and see them through the eyes of a future generation, see them through the eyes of the people who we first got involved in Star Trek with 18 years before, with Picard and Riker and Data, etc., and to see the history of how Archer and his crew went from where we had them to where, eventually, the Federation was formed, in some kind of a magical holographic history lesson. Deviant Art presents the above picture mixing Star Trek and Doctor Who. 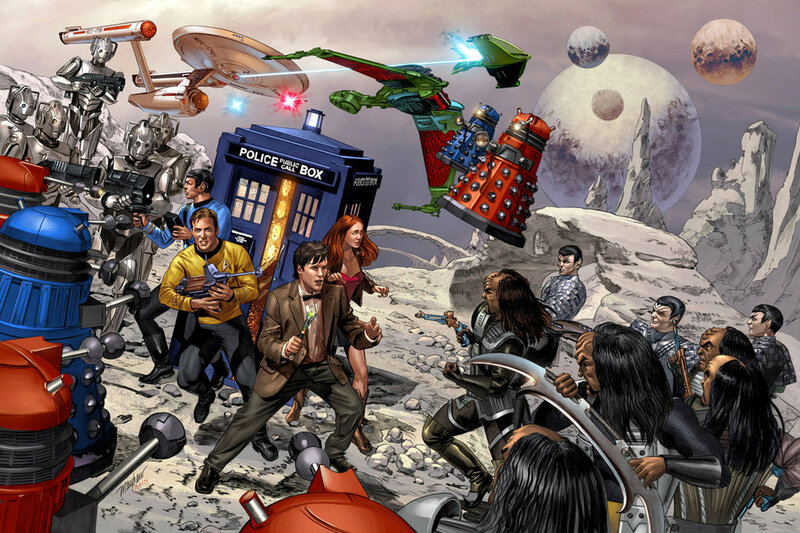 Kirk, Spock, the Doctor, and Amy Pond fight off Klingons, Romulans, Daleks, and Cybermen. (Click on picture for larger version). Here’s one of the best YouTube music videos since Obama Girl—Star Trek Girl. With her references to going to Vulcan I’m happy to see that Star Trek Girl clearly lives in the Roddenberry universe and not the J.J. Abrams universe.